^ Groves, C.P. (2005). Wilson, D.E. ; Reeder, D.M. (eds.). Mammal Species of the World: A Taxonomic and Geographic Reference (3rd ed.). Baltimore: Johns Hopkins University Press. p. 163. ISBN 0-801-88221-4. OCLC 62265494. ^ Teas J, Richie T, Taylor H, Southwick C (1980). 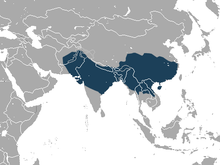 "Population Patterns and Behavioral Ecology of Rhesus Monkeys (Macaca Mulatta) in Nepal". In Lindenburg, D. (ed.). The Macaques: Studies in ecology, behavior, and evolution. San Francisco: Van Nostrand Reinhold Company. ISBN 0442248172. ^ Cilloniz, Cristian; Shinya, Kyoko Peng; Xinxia Korth; Marcus J. Proll; Sean C. Aicher; Lauri D. Carter; Victoria S. Chang; Jean H. Kobasa; Darwyn Feldmann; Friedericke Strong; James E. Feldmann; Heinz Kawaoka; Yoshihiro Katze; Michael G. (2009). Diamond, Michael S (ed.). "Lethal Influenza Virus Infection in Macaques Is Associated with Early Dysregulation of Inflammatory Related Genes". PLoS Pathogens. 5 (10): e1000604. doi:10.1371/journal.ppat.1000604. PMC 2745659. PMID 19798428. This page was last edited on 12 April 2019, at 11:31 (UTC).